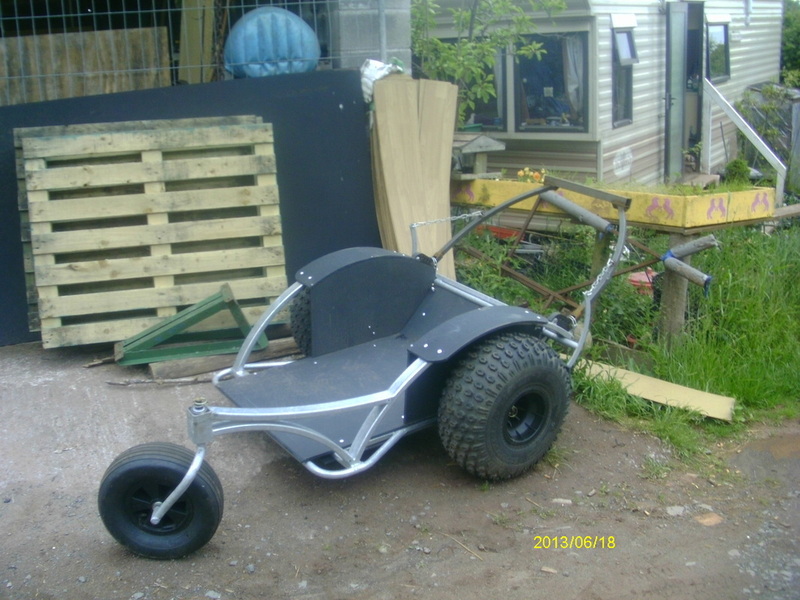 The iBex (mk1) is a 3 wheeled vehicle with a treadplate floor,wide front wheels with a small jockey wheel for ease of turning. It was originally designed for disabled use allowing a wheelchair to sit comfortably and securely, but is also as equally suitable as a 2 to 3 seat standard vehicle. It is made of mild steel galvanized which protects the metal inside and out, giving it long life. 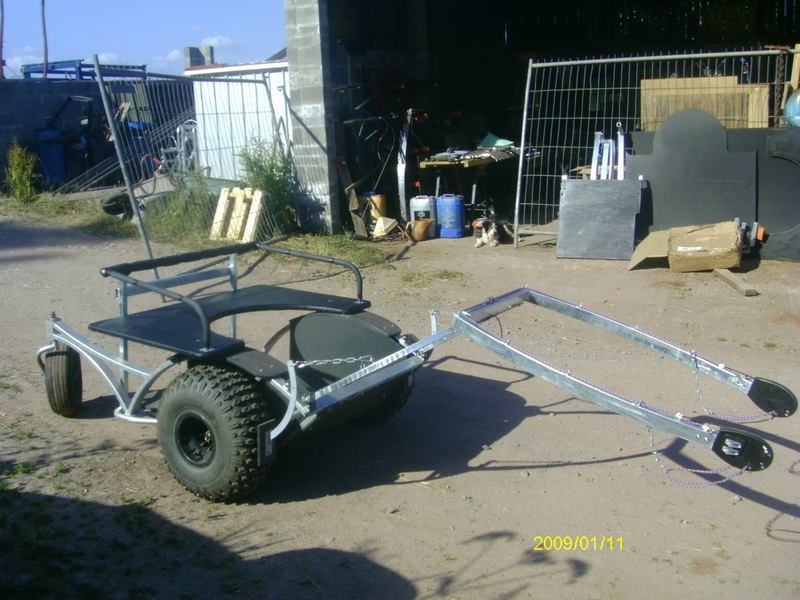 The iBex (mk1) with seat will carry 2 adults comfortably or if used around the farm will carry a bale of hay etc. 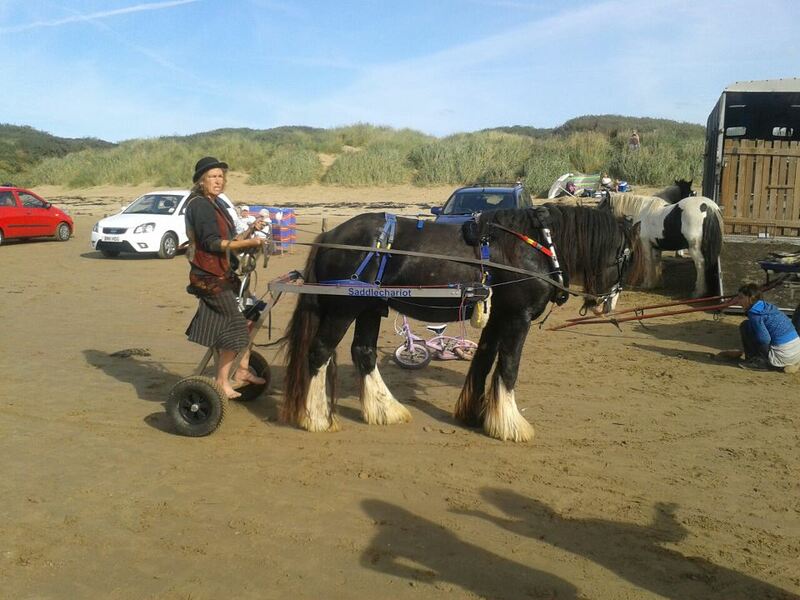 The iBex (mk1) will fit pony/horse 33" upwards. If you're considering buying both vehicles using the same pony/horse it would be possible to use the shafts and harness from one vehicle to the other. This will reduce the cost so contact us for further details. If you're a land owner or estate owner or access provider, this is a great, safe and reliable way to give access for disabled people. It's a great way of giving access to less accessible areas for the disabled and can be a viable business. We can also offer advice and training. If you were considering multiple iBex's(mk1) contact us for price. When you're ready to order we will send you a sheet with the sizes we require to make your vehicle and harness. A 50% deposit is required with the remaining balance prior to collection or delivery. We accept cheques or bank transfer. Bank details on request, make cheques payable to N G Sanders. If you have any questions please contact me, i'm here to help. ​The iBex (mk1) was tested by Kingston University. 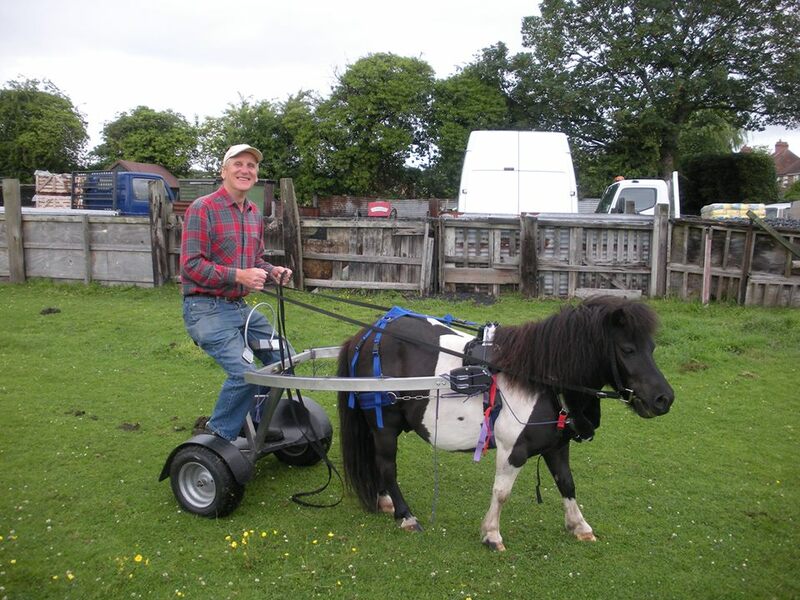 The IBex is a safe, well designed and manufactured carriage that is used by disabled people and pulled by a horse, pony or donkey. 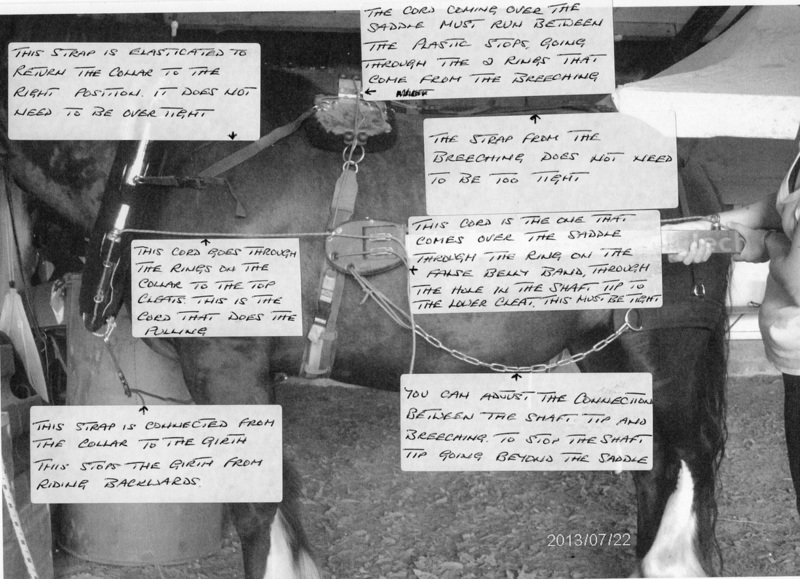 The quick release system is a simple device that quickly releases the pony from the carriage. 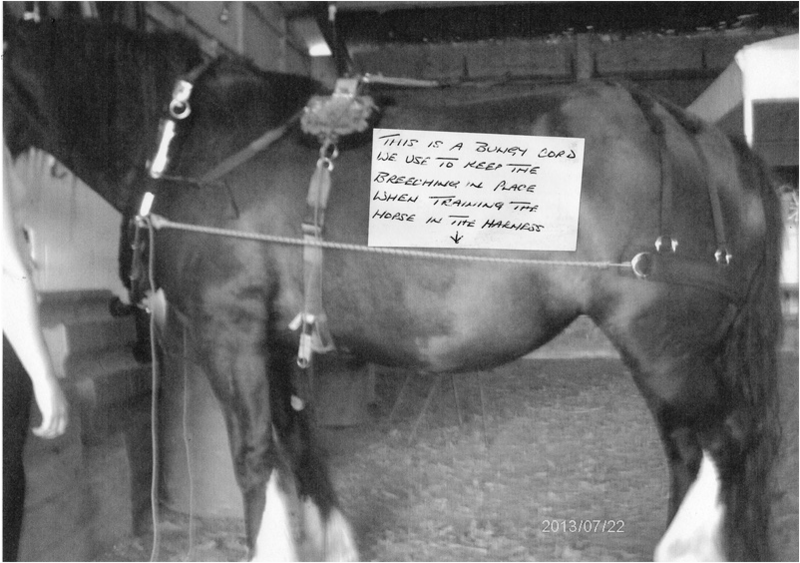 It can be activated by the ‘walker’ who is alongside the pony. It can also, if required, be operated by the disabled person in the ‘trolley’ (as it is sometimes called). At this point the mechanical brakes are deployed and the carriage comes to a gradual halt. The brakes can only be released by lifting up the shafts. The design and manufacture has been tested at the School of Engineering, Kingston University. It has been the subject of various papers/dissertations by MSc and B.Eng Engineering students , who have been supervised by me. It has undergone stability tests and due to its low centre of gravity the carriage managed an angle of over 700 to the horizontal before the trolley became unstable. The welds and joints of the frame have been tested and the strength of the frames and axles has undergone a computer program for stress analysis. This computer program is called ‘Solidworks’ and is a Finite Element Analysis (FEA) and the results showed that there was no stress anywhere on the carriage that exceeded the safe working load. An actual loading of 200kg was applied to the bed of the carriage with no appreciable deflection beyond the designed strain. If there are any engineering questions of the use, or design of the Ibex then please do not hesitate to contact me. Our insurance company for saddlechariot/ibex is KBIS. We use brokers Isca Barum. The person we deal with is Kirsten Self, her directline number is 01392 261157. They cover manufacturing, demonstration and instructions for us. 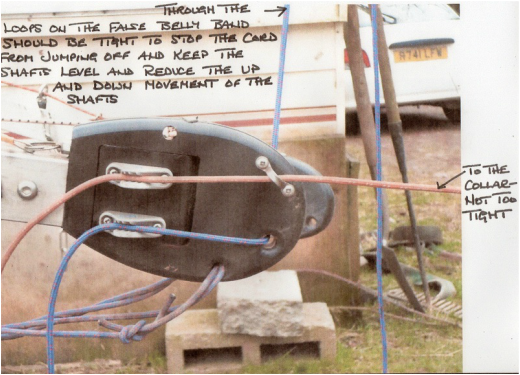 On the left is a photo of how to connect the cords from the chariot to the harness, always make sure that the spring loaded pin that is attached to end of the cord that goes into the HDPE shaft tip is fully inserted. Never have the cord that goes round the top of the shafts too tight, as this will result in premature releasing of the vehicle.